High-tech infotainment and safety features drove up the price of new cars to a record high last quarter — pushing many consumers to opt for used cars. Sales of new cars are falling, as higher prices push consumers towards used cars, a segment that is seeing a corresponding spike in sales — and it's a worrying trend, say industry watchers. For the first time in six years, first-quarter car sales have fallen below 3 million units, according to a joint forecast by J.D. Power and LMC Automotive. Automakers will have sold 2.94 million vehicles for the quarter, said Thomas King, senior vice president of data and analytics at J.D. Power. That's an overall slump of 2.5 percent year on year, to 4 million units, Power and LMC said. Forecasts of what analysts have called “peak auto” have been surfacing for several years, with experts warning that the boom years following the Great Recession can’t go on much longer. New car demand did slip by about 2 percent in 2017 but, despite almost universal expectations that the downward trend would continue, 2018 actually brought a modest uptick in sales. But the first two months of 2019 have seen sales slump once more. The heavy weather that hit much of the country took some of the blame, but things aren’t looking much better as March draws to a close. J.D. Power and LMC anticipate new vehicle demand will be down 2.1 percent for the month. Fueling that slump is the average price of a new vehicle: $33,319 for the January-March quarter, an all-time record. While the upward trend has helped buoy manufacturers’ bottom lines, it does have a downside, with industry experts concerned that many potential buyers are being priced out of the new car market. The increase in vehicle pricing is definitely a matter of “concern,” said Hinrichs. "Consumers have adapted over time to keep monthly payments within a relatively close band by stretching out their loans ever longer,” he noted. Automakers have helped keep vehicles reasonably affordable by offering low-interest loans and often subsidized lease deals. But with many loans now running to 72 months, a number of analysts warn there’s no more room to stretch loans out. And the situation is being compounded by a series of rate hikes implemented by the Federal Reserve over the last two years. Those who track the industry have begun to notice some disturbing signals. Traditionally, demand for both new and used vehicles follow the same trajectory, rising and falling simultaneously. The exact number of used vehicles sold each year is a matter of speculation, as millions are transferred among family members and friends. 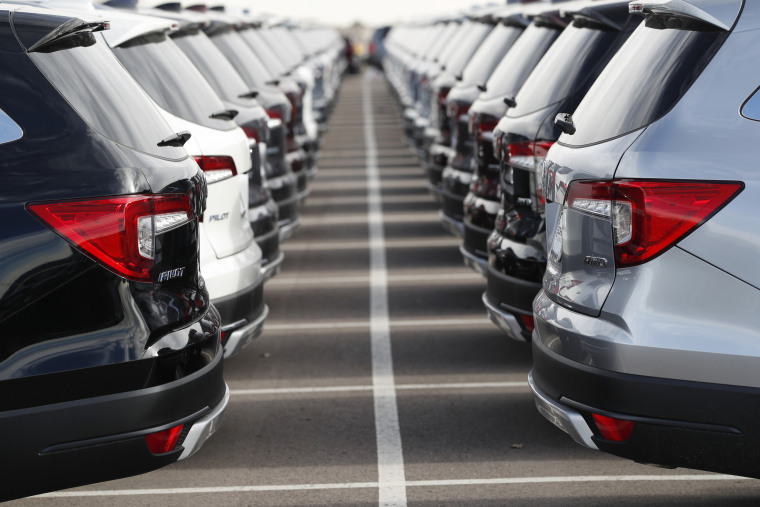 Tracking dealer sales reveals several trends that threaten the new car market. Over the last several decades, manufacturers have become increasingly dependent upon leasing. When vehicles are returned, usually after two to three years, they are routinely inspected and repaired, as necessary, and then sold as “certified pre-owned” vehicles with like new warranties. The savings can be substantial. Back in 2013, according to Edmunds.com, the average three-year-old vehicle cost $11,000 less than the new version of the same model. Last year, that jumped to $14,000. That has been a draw for many traditional new car buyers, industry data reveal, and the situation is only expected to accelerate as new car prices continue to rise. Compounding matters, Edmunds forecasts a record number of off-lease vehicles will come to market this year. Not all new car buyers are bargain hunters, said Ford’s Hinrichs. Many customers want all the latest bells and whistles, including high-tech infotainment and safety gear. But that technology is also helping drive up prices, he acknowledged. If anything, competitive pressures have forced manufacturers to rein in price hikes on most new products. But that could become more difficult in the months ahead. President Donald Trump’s tariffs on imported steel and aluminum have hammered manufacturers operating U.S. assembly plants. Automakers have so far largely swallowed these added costs — Ford estimated its share to be as much as $1 billion — but that might not continue.